Please see the Winter 2003 issue of Celebrating Greyhounds magazine, page 14, for the article "The Family With Greyhounds" by LeAnne and Tom Suhre, parents to Janie (one of GALT's dogs) and featuring our own Nancy Colwell (and GALT dog, Xander) and Nancy's brother, Michael (and GALT's Rooster) and other greyhound family members. I guess you could call us a "family of greyhounds." 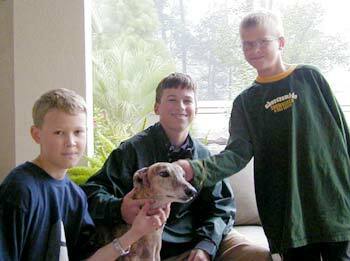 My son, Wes Colwell and his family of The Woodlands, Texas, were the first to adopt a greyhound. He did this on the recommendation of his sister, Nancy Colwell. She wanted to rescue a dog and had been reading about greyhounds and checking into the adoption procedure. Wes and his family have a cat, so they took Miss Kitty and went to "pick out" their greyhound. There were many to choose from, but they were chosen by a red brindle female named Breezy. She did fine with Miss Kitty and seemed to be very drawn to the three boys. So, she went home with them and became Greyhound #1. She has been a wonderful addition to their family. In typical greyhound fashion, at first Breezy would not go upstairs. However, once she learned, she became attached to one of the boys' beanie babies and would bring it downstairs. They would find it, take it back upstairs and hide it in the middle of the basket of beanie babies. She always found that same one and would bring it back downstairs. This was our first "greyhound granddog" and she really melted our hearts when Tom and I went to Texas to visit. It was then that we began to think if we ever got another dog, we would like to give a greyhound a good home. A short time later, I got a phone call from Nancy, and she told us we had another "granddog". Of course it was a greyhound, and she named her Korkie. She was VERY shy at first and would stand in a corner whenever we came to visit. However, after several visits, she has warmed up to us and now loves to come visit "grandma and grandpa" in Oklahoma City. She is very loving and enjoys all the attention she gets from us, "cousins" and "aunts and uncles". She is also a red brindle. So, our family had greyhound #2. Several months later, Nancy had been fostering a blue brindle male named Xander. He was such a sweetheart that she could not give him up. 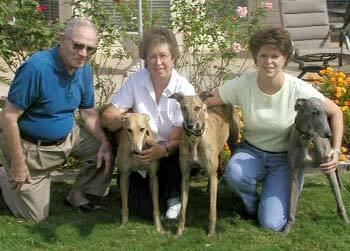 So we now have three "greyhound granddogs" in Texas. Xander loves his toys, and often carries them one at a time and puts them on his bed. That is, until Korkie comes and steals them and puts them on her bed. 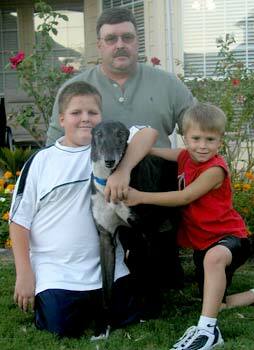 Nancy's brother, Mike Colwell in Lawton, Oklahoma, fell in love with the greyhounds after spending time with the three that were already a part of our family. And so, this summer, a beautiful black male named Rooster became our fourth greyhound granddog. Mike's two boys give him lots of love and attention. Rooster likes them to run with him around their big back yard. He is not much for playing with toys, as he prefers to sprawl out on his big bed in front of the TV. Tom and I began thinking we were ready to make the leap back into "parenthood". So, I kept looking on the website at the greyhounds available for adoption, and each one was so cute. However, one especially caught our eye and our hearts. Her name was Jane and she has these big brown eyes. She is a red fawn. And as you might guess, there are now five greyhounds in our family. I keep wondering what it will be like when they all come to our house during the holidays! Janie, as we now call her, has been such a joy and after initial adjustments on our part and hers, is very settled in. She has her favorite places to sleep and loves to run in the yard and go for her walks. She has a favorite toy Tom has named Squeaky and she takes it in the yard, tosses it up in the air and runs with it. From the first day we had Janie, when the doorbell would ring, I would put her leash on so she would not slip out. Now when it rings, she comes running to me for her leash so she can go greet everyone at the front door! She loves people and especially kids. Not to forget our other granddogs, we have Peyton, a dalmatian who lives with Korkie and Xander. She tries her best to be like a greyhound. I guess she will just have to put up with these greyhounds - but she gets a little extra special treatment at grandma's house. When Nancy is not there, she gets to sleep up on the couch. Of course, we don't tell Nancy, and Peyton gets down when she hears her at the door. Our daughter in Edmond, Oklahoma is the only holdout on greyhounds. She has a little, sweet poodle named Mollee. She holds her own, though, with these big dogs that tower over her. Maybe someday she will have a greyhound brother or sister -- and then we will have a totally "greyhound family".